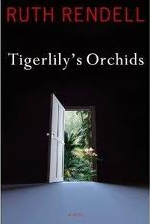 I'm a huge fan of Ruth Rendell, so I was thrilled to find her latest novel, Tigerlily's Orchids, at my local library. Although she has stopped writing about Inspector Wexford, her "one off" novels have always also been quite enjoyable. The latest novel takes place in a block of flats in London. The gorgeous and spoiled Stuart Font has used an inheritance from an aunt to purchase a flat and also to avoid getting a job. He decides to throw himself a housewarming party and invite the other residents of the building. Stuart is having an affair with a married woman, Claudia, who has a violently unstable husband. The other residents of the building all have their own problems and secrets. Olwen, an older lady who just wants to be left in peace so that she can drink herself to death, naturally attends the party for the free alcohol on offer. Rose and Marius are two aging "hippies" who once had a one-night stand, but are now just neighbors. Michael Constantine, a doctor who is in trouble for writing facually incorrect medical articles, attends with his wife Katie. The three single girls sharing a flat also wouldn't miss a party, and the cleaning lady Richenda and her caretaker husband Wally also show up (although they weren't exactly invited). Not long after the party starts, Claudia's jealous husband Freddy shows up, and the party breaks up when Freddy attacks Stuart. Stuart ends up with a broken arm. Adding to this cast of characters is Duncan, a retired mechanic who lives across the street. Duncan observes the comings and goings of the residents of Stuart's building, as well as the odd events in the house next door. It is occupied by what appears to be a family of Chinese immigrants. Duncan doesn't have any contact with them. Oddly, his house is always sweltering, even on the warmest days. One day, Stuart is in a shop when he spots the most beautiful girl he's ever seen. He doesn't speak to her, but continues to watch for her. Not suprisingly, at this point his relationship with Claudia begins to fizzle out (although Claudia isn't too happy about this). Eventually, he learns that the beautiful girl is part of the "family" that live across the street, next to Duncan. He is able to speak with the girl (whom he calls "Tigerlily") and asks her to meet him. She doesn't speak much English, but agrees to meet him. On their "date," she asks Stuart to help her get a passport. Her "family" is very strict, and she must hide her meetings with Stuart from them. In the meantime, one of the party girls, Molly, has fallen madly in love with Stuart and decided that she will take on the job of cleaning his flat for him since he is injured. Stuart barely acknowledges her existence. Stuart has arranged another meeting with Tigerlily in a park. The next day, he is found murdered in the park, and there's no shortage of possible suspects. The first to come to mind is the enraged Freddy, but there's also Tigerlily's "dad," who doesn't like her talking to strange men. Or could there be someone else with a grudge against Stuart?? In amongst all this activity are woven different social issues: illegal immigration, drug trafficking, modern day slavery, substance abuse, even pedophilia! I do love Ruth Rendell, but this book might have benefitted from about half the number of characters and issues that were included!